We've seen a few amber-focused fragrances surfacing amongst the new releases of late 2011 and early 2012, and that's fine with me: I'm tired of oud being the "it" note, since I don't care for it at all, and I usually enjoy some amber in my floral fragrances. Two of the recent arrivals are Aroma M Geisha Amber Rouge, a sister fragrance to the line's Geisha Rouge, and Atelier Cologne Amber Nue. Aroma M's Geisha Amber Rouge (shown below right) perfume oil is packaged in a roll-on dispenser wrapped in the line's signature Japanese paper, and the notes of its composition include amber, cinnamon, clove, star anise, resins, and incense. It's much less peppery-clovey than the original Geisha Rouge, if I remember Rouge correctly. Overall, it's a spiced honey fragrance, with a dash of cinnamon and a boozy, brandy-like note. There's a cushion of vanilla and anise in the base, and just in case you're looking for a Valentine's Day fragrance, you might want to remember that these two notes supposedly have aphrodisiac powers. One of the "resins" seems to be a sweet benzoin. As an aside, I greatly prefer Amber Rouge to the big recent release Prada Candy, whose caramelly take on benzoin-and-woods had a queasy effect on me. Amber Rouge has very good staying power and low sillage. Overall, these are two very different imaginings of a classic "Oriental" theme in fragrance, but amber is an idea that leaves room for interpretation, so I enjoyed both ideas. (I found this post on Perfume Shrine to be useful when I was thinking about amber this week.) Will there be more ambers to come? Very possibly, but I'm willing to follow the trend a while longer. Aroma M Geisha Amber Rouge is available as 8 ml perfume oil in a roll-on bottle ($75). Atelier Cologne Ambre Nue is available as 30 ml ($70) and 200 ml ($185) "Cologne Absolue." For purchasing information, see the listings for Aroma M and Atelier Cologne under Perfume Houses. Note: top image is Naturbernstein beleuchtet [cropped], via Wikimedia Commons. Aroma M Geisha Amber Rouge sounds kinda nice, but $75 for 8mL probably means I won’t go out of my way to sniff it! Samples may be available… but I *was* wondering whether the pricing might have gone up for that line. At least the scent is concentrated! I really think the “Aroma M” niche brand is one of the special ones; there’s a very unique style to her blends and I think they have a quirky, off-kilter beauty to them, with unusual contrasts within…like dried floral scents mixed with greens and tea notes, currants mixed with absinthe notes — that sort of thing. She’s informed by traditional, Japanese aesthetics and I do pick-up an “Ikebana vs. packed-posey bouquets” kind of sensibility to all her blends and I’ve bought some in full size and sampled all the rest. My experience with a full bottle of her roll-on oils, was with “Geisha Blue” which I thought was one of the loveliest, most unusual jasmine blends I’ve tried. I have to say, the tenacity of its staying power impressed me and just a couple of rolls on my wrist and neck, produced such intense, rich, white floral cut with dense violet leaves sillage, that I vowed to never apply more than one roll on my wrist and to my neck ever again. Just the same, I had three separate people tell me I smelled “beautiful” that day, even though I felt like I was robed in a coat of dense, jasmine petals. I still have almost a full bottle and I ordered it almost a year ago, now. I don’t know how her oils will wear on you, as far as longevity goes, but that was just my experience with them, so I don’t think the price is too far off base. Intense sillage and a full 8-10 hours wear, on a little dab of an application. My goodness, you have just sold me on the line! That really does sound lovely! I’m not saying never, but it scares me to get comfortable with that kind of pricing. I already spend more than I feel comfortable admitting to all but the closest friends! Thank you for the great mini-review! And as jasmine is one of my favorite notes (along with violet leaf! ), you’ve sold me on Geisha Blue. Thanks, NLB! I bought a Geisha Blue for a friend once, years ago… so pretty!! …she does offer sample packs too, everyone, so you can test each one out for a day, before you buy :). I think her blends each develop in interesting ways and there’s quite a variety of tastes to choose from. Some of her most popular ones — like “Pink”, “Blanche” and “Violet” are very femme and sweet, but I love that she has oddball blends like “Green”, “Marron” (an overripe, lily of the valley blend, that has a noticable chestnut note in it) and “Geisha Blue”, as well. “O-Cha” was my FB EDP purchase and it’s a fabulously dry, green tea note, with rose and honey, but no sweetness — it’s very unusual. “Geisha Noire” is one of the best incense blends I’ve ever tested, sort of a more refined take on “Opium” or Georgio “Red”; it’s pure and total Japanese incense, smooth and smoky, no relief from it with any flimsier notes. I stumbled upon GB while looking for any blends with Blue Chamomile in it because I love the note so much (like a minerally, rainy-day apple blossom, smashed with a green tea note) but very few houses use it as a showcased note in any of their scents. Apparently, it’s in “Geisha Blue”. I’m not entirely comfortable with the pricing — I think they couldn’t edge-up much higher, before people start deciding to pass on FB purchases — but the longevity and dense sillage produced from the oils, does offer a compelling argument for value; they are highly concentrated perfumes. I love Violet and Marron, both unusual “fleurmands”! Maybe I should write a review of those two. Pink is a perfect fragrance for a teen girl (although a bit pricey for that purpose, maybe). I’ve tried and love both. Carlos, you’re having a good perfume-moment, then! Enjoy. I like the description of Atelier Cologne’s Amber Nue. I normally like fragrances that have bergamont, citrus and patchouli and this one sounds wonderful. Madhatter, there isn’t much patchouli, but you very well might like it! It’s definitely citrus-woody, and not too sweet. Sounds perfect to me. Thank you Jessica. Where can I get a hold of a sample in the UK!? I’ll have to ask a friend in the States…. Amber Rouge sounds a bit more “me” than the Ambre Nue, but I’ll happily try them both since there’s no such thing as too much amber in my wardrobe. And yeah, it does seem like the Aroma M price has gone up though I’ve never actually bought one. I’m with you, Jessica. Oud is definitely not the one for me in perfume. I can only tolerate it in the Les Orientalistes from Annick Goutal and Montale’s White Oud so far. I keep thinking there’s got to be one out there for me but so far, I haven’t truly found one that doesn’t smell too medicinal or doesn’t overpower most other notes. And oddly enough, I am crossing my fingers for a more amped up version of Prada Candy in the next couple years. I love it very much but it is so light and sheer I wish it were stronger and lasted longer on my skin. Have you tried Micallef’s Vanille Aoud? It’s definitely sweet with caramel and vanilla—a little bit like Prada’s Candy—which keeps the oud from being too Band-Aid-like and medicinal, but there’s just enough oud to give it some bite. I’m surprised how much it’s grown on me, because oud usually isn’t my favorite either! AS, I’m usually happy to encounter amber… even more so, in home fragrance! Two of my favorite good-smelling home fragrance items are Diptyque’s Ambre candle and L’Artisan Parfumeur’s amber ball with resin chunks inside. Ah. DL&Co’s Opium Den is an amber lover’s dream, Jessica. Doesn’t say a word about amber in the description, but I get a ton of it. Really?! I’ll have to try that one, then. I love the name! Hi Janice. I haven’t tried that one yet but am off to add it to my sample list. It sounds really nice and any approach that makes the oud less medicinal definitely has my attention. Jessica, those sound great. Does the L’Artisan ball have good throw/sillage? We have some fairly large rooms (it is an old house) and that cool little ball has been tempting since it came out a few years back. AS, the scent tends to stay in a fairly small radius around the ball (actually, I have the “pebble,” no longer made, alas! )… until the sun warms it, or unless you place it near a radiator, etc. in which case it really begins to radiate ambery waves of scent! I haven’t tried any Aroma Ms, and this one sounds worth sampling. I’ve also wondered about those L’AP amber balls – tempting! I’ve found many of the ambers I’ve tried (not that many yet) too sweet or something. I do like the idea of amber – it seems like a natural for me -but haven’t quite found the right one(s) yet. I’ve had better luck with leathers – I love lots of those. I am determined to find a leather to love. I have given up trying to find other notes to do this with, but darn it, I love the smell of real leather, and there must surely be one leather perfume that won’t go sour on me! JolieFleurs, have you tried PdE Cuir Ottoman and Heeley Cuir Pleine Fleur yet? There’s also a category of fruity leathers, such as L’AP Traversee du Bosphore, SL Daim Blond and DSH Mata Hari that can be delicious if you find he one for you. I have not, and will remedy that soon, thank you! Fruity leather doesn’t sound appealing, for some reason. There is always a leather spoken of here, from one of the large houses, that is apparently quite good, and inexpensive. I never remember which house, but I think it’s either Chanel or Lancome. Have you tried either of those? Problem is, neither house usually works for me! I need to get myself to the fancy mall and check them out. The inexpensive one would be the Lancome, although Chanel’s Cuir de Russie isn’t bad if you buy a decant rather than the whole bottle. And that might be one in the smaller bottles now too. The Lancome went sour on me, while the Chanel is beautiful. Good luck! Noz, it’s true… some ambers have too much vanilla! I guess vanilla is an easy “hook,” since it’s such a popular note… but it does make the amber sweeet. I just got a decant of Ambre Nue. While it’s good, I think it’s going to be best in warmer weather. The Atelier Colognes that I like all seem best in warm or hot weather. This could be the summer amber for me, just as their Vanille Insensee is my summer vanilla! Suzy, I’ve sampled Orange Sanguine, Trefle Pur, and Grand Neroli, and I agree, they were all perfect for summer! This one has an interesting construction, because it has strong notes but it’s not heavy, if that makes sense. I knew this had to be coming soon – a review that ignited lemmings in me! It’s been months now of reading reviews inspiring nothing more than a mild “hmmm”, so I guess I was due! Thank you, Jessica! Great descriptions. It’s always just a matter of time, isn’t it? Many thanks for the linkage. Glad it was useful! And lovely takes on two winter-y fragrances. Thanks for clarifying they’re different, I was curious on the Geisha M one and now can sit easy. Thank *you*! I expected these two to be more similar when I read the descriptions, but they really do head in different directions. 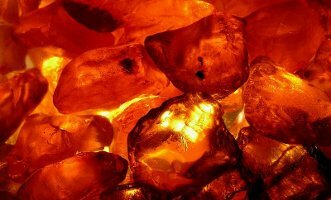 Amber fragrance is purely functional – gotta have one or two and that’s enough for me. When they run out, I may repurchase or find another amber to love, but while there is still a drop of amber in the bottle there are more interesting notes to explore. For now, Ambre Narguile and AP’s Ambre Extreme do the job nicely and it doesn’t seem likely that any of these two would provide a suitable replacement. Nile Goddess, I have a very small decant of Serge Lutens Ambre Sultan, which I really admire… and I remember liking i Profumi di Firenze’s Ambra del Nepal, although that one was on the sweeter side. …one last thing! The kimono bags are so beautiful. I ordered the purple one and now realize that I’ve been missing-out by not having every piece of clothing I own, made out of such beautiful cloth :). Since finishing the fragrance, I use the bag to store all of my guitar picks in it. I also carefully removed the paper from the bottle and along with the other paper the perfume oil came packaged in, made a framed collage out of the whole thing. The paper was too beautiful to throw out. So, that’s for “presentation”. Okay — I’m done ;D! Oh, I’ve never seen the kimono bags! Wonderful. I do love the printed Japanese papers… such beautiful patterns and palettes.